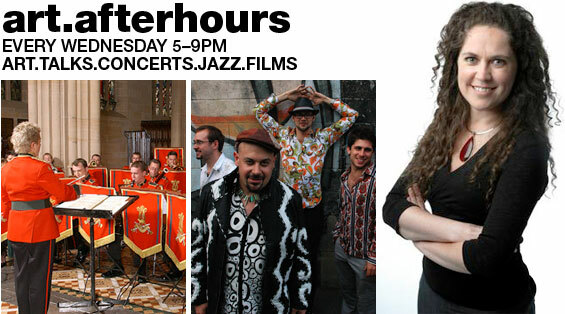 Join us at Art after Hours during December for events which include a celebrity concert by Monsieur Camembert and a celebrity talk by Annabel Crabb. Exhibitions on view include the beautiful Rupert Bunny: artist in Paris and Garden and cosmos: the royal paintings of Jodhpur. Please note: the Gallery will remain open but there will be no Art after Hours events on 23 December and 30 December. Normal scheduling resumes 6 January 2010. 9 Dec - Annabel Crabb, ABC online chief political writer, in association with Rupert Bunny: artist in Paris. 2 Dec - Monsieur Camembert, in association with Rupert Bunny: artist in Paris. 16 Dec - The Australian Army Band Music of the belle époque, in association with Rupert Bunny: artist in Paris. 6 Jan - Bollywood Spice, performed by the Mango Dance Studio, in association with Garden and cosmos: the royal paintings of Jodhpur. 9 Dec 5.30pm - The Australian Army Band Music of the belle époque, in the exhibition Rupert Bunny: artist in Paris. 2 Dec - Deborah Edwards, curator, in association with Rupert Bunny: artist in Paris. 9 Dec - Elizabeth Maloney, assistant curator photography, in association with 6 photographers. 6 Jan - Craig Judd, art historian, in association with Rupert Bunny: artist in Paris. 13 Jan - Simon Ives, conservator, in association with Rupert Bunny: artist in Paris. 2, 9 & 16 Dec - Veren Grigorov, Hungarian gypsy violinist, in association with Rupert Bunny: artist in Paris. 6 Jan - Eddie Bronson and friends, in association with Rupert Bunny: artist in Paris.